Noted since Roman times for its fine marble quarries, the town of Carrara and its twin, Massa, are located in a Tuscan valley between the sea and the Alps. As Jews worked in both towns, the tiny community that existed there from the sixteenth to the nineteenth century was known as Massa di Carrara. 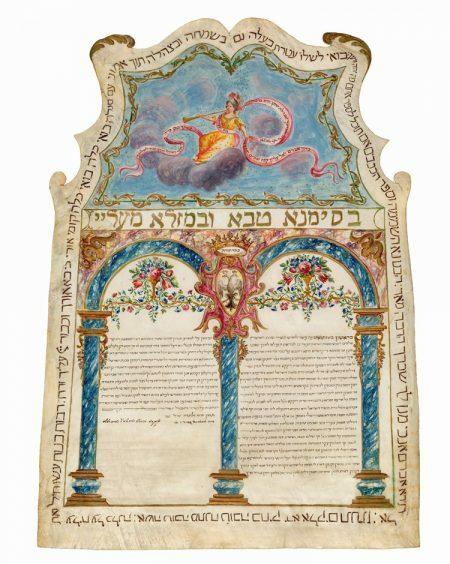 Its name appears in this form in Hebrew documents, including the present ketubbah, which, in all likelihood, is the only illustrated example that survives from this community. In the upper section, azure heavens are studded with tiny gold stars, symbols of fertility (cf. Genesis 15:5). In the center, seated on gray clouds and dressed in a yellow gown with gold stars, is an angelic-looking young woman. This allegorical figure of Fama (Fame) blows a trumpet to announce the “good name” of the bridal couple. The fluttering red ribbons around her bear biblical inscriptions, allud- ing to the couple and the wedding (Genesis 14:19, 12:2, 24:50; Psalms 128:3). The choice of the blessing on this ribbon to the Patriarch Abram before his name was changed to Abraham, in addition to laudatory verses in honor of Abram along the border (Genesis 15:1, 5), was made because this form of the name is closer to Abramo, the Italian name of the groom.